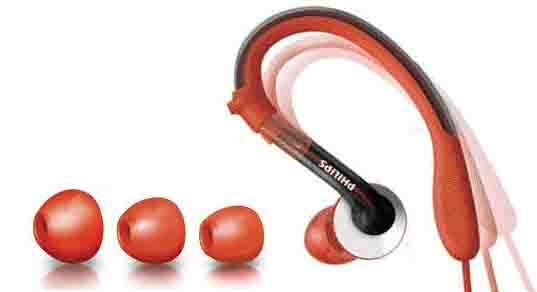 Philips did a complete turnaround when they developed these Philips SHQ3000 Action Fit Earhook Sports Headphones. These are so much better than the SHQ1000-28 offering. Unlike some of the other earhook-featuring earbuds we’ve reviewed, these Philips SHQ3000s route the audio cable in a better way. They use the earhook itself as a router. So, the cable exits the earbud at the far end of the earhook, not at the bottom. This way, jerks and pulls do not dislodge the ear piece nearly so much as earlier designs. Detail: The earhook here is a hollow tube. Then through this, they route the cable from the ear speaker. It goes around the outer ear, and then leaves the earhook at the bottom of the ear, behind the lobe. This makes it harder to pull out the earbud, should you tangle a pumping arm in the cables. Why? Because this design allows the cable to leave the earbud from behind the ear, not from in front. So you have the added restraining that your ear lobe provides. This better secures the earbud. It also means that tugs on the cable do not mis-align the ear drivers. Furthermore, this cuts down on the need to readjust them too much for best sound. Once you put these on, they indeed stay in place until you remove them. Why? Because in this design, the outer ear absorbs much of the pulling before it reaches the bud. 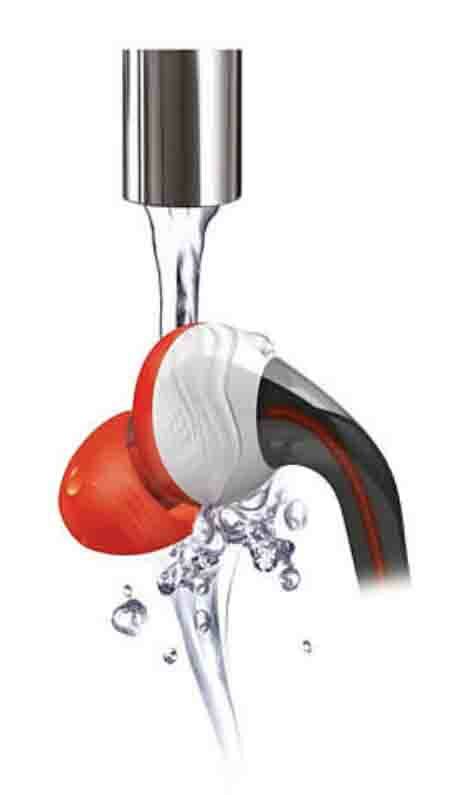 Philips SHQ3000 sports actionfit earhook headphones under a water stream, stock photo. First of all, yes, sweat proof, perhaps. But do not submerse these earbuds, for they are not waterproof. 3.5mm gold-plated connector and super flexible audio cable. Frequency response: 15 – 22,000 Hz. Sensitivity: 102 DB. Maximum power input: 20 milliwatts. Impedance: 16 ohms. Philips indeed traded away the waterproof feature for the greater high fidelity sound of these ported earbuds. But they left the hallmark durability and ruggedness in this sweat proof and washable model. supplied at all cable exit points. Wearing fatigue is low, perhaps due to the low weight of these buds. You get just over four feet of audio cable. Sound and vibrations do not readily reach the earbuds along the audio cable. Stability, high fidelity sound, and great fit accurately describe the SHQ3000s. They show how to change the ear tips in the included instructions. Three sizes of anti-microbial ear tips included. Snug fit and stability fairly describe this earphone set. that you use during intense exercise. A definite improvement, these Action Fit in-ear, in-canal headphones not only sound much better than those waterproof SHQ1000-28s. But they also feature flexible earhooks. These are not only comfortable. But they hold the buds stubbornly at the right position in the ear. Plus, they stay there through even the most strenuous sports-related activities and exercises. Find a cable-securing black spring-loaded clip on the cable too. You can move this cable keeper up and down the entire cable length. Used to stop excessive cable flapping during exercise. Fasten it mid-way up to your clothing for best results. There’s also a black carrying pouch to put your earbuds in when not in use. Work well in both indoor and outdoor exercising. However, due to the ports, avoid exposure to heavy rain. These phones block surrounding environmental noises very little. This helps ensure your safety while riding or jogging along busy streets. They clearly mark each headphone at the top of the cable strain relief stem. It has a white letter on a black background. This indicates either left (L) or right (R) channel. The SHQ3000s we bought look as follows. They have a red cable. Red strain relievers for the cords on the jack body. Red anti-microbial ear tips with black stripes on the tops of the earhooks. An effective, high-performing accessory for iPod and iPod Touch media players. Comfortable to listen to in bed, no matter what your head position is on your pillow. We paid $25 roughly for the SHQ3000s. For that cost, we like the decent construction and sound. Philips SHQ3000 sports action fit earhook headphones along with extra earcushions included, stock photo. Don’t take them into the swimming pool. A bit harder to put on than earbuds that do not include earhooks. How? Because the hooks often get tangled up with the ear pieces of eyeglasses. Volume output is a bit lower than the average of other earphones I’ve tested. The left and right earbuds are not interchangeable. Insert them backwards (right bud into left ear, and left bud into right ear). Then, they neither fit as well, sound as good, nor are they as comfortable. So avoid playing these too loudly on trains, planes, and buses. But if you don’t, you might disturb other passengers and force them to hear your music as well. No microphone or remote control in this model. However, they designed these for sports applications. So we expect that a remote at least, would get little use. Since such remotes tend to feature very small buttons, it’d be hard to work them while exercising. We rate these sports phones thus, at 95 out of 100. Indeed, we find them durable, sounding pretty good, and not overly expensive. Furthermore, they come with a one-year limited warranty. Other companies should follow Philips’ lead here, and put the high-quality construction found in these earbuds into their own. Even non-sports earbuds could benefit from the hearty build techniques found herein. Thus, we suggest these to sports enthusiasts and audiophiles alike. We bought ours at Walmart. But you can find them on Amazon, eBay, and other larger online stores and outlets. So look for them in the red, white, and blue box, and the clear plastic inner packaging. Further, a window on the front allows viewing of the headphones and some of the included accessories inside. 2019-03-21: Added tags, meta description, subheadings, and key phrase targeting. Shortened sentences and paragraphs and fixed typos as well. 2017-02-10: Added pictures and revised the tags list. 2015-01-10: Revised and extended the content. 2014-11-25: Added white space, adjusted ad placement, extended the References section, and revised the content. 2012-10-03: Originally published this piece.